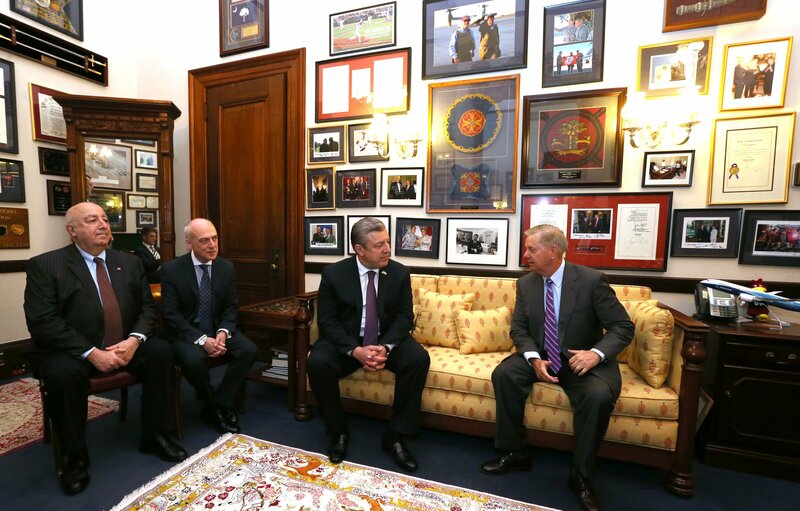 "Georgia is the only country in the neighborhood of Russia, which pursues clearly western policy and does it in a thoroughly reasonable and rational manner" states Lindsey Graham, Republican Senator at a meeting held with Giorgi Kvirikashvili, Prime Minister of Georgia. Mr. Graham, Senator from South Carolina gave a high appreciation to the reforms implemented by the authorities of Georgia. It was noted that level of US-Georgia economic cooperation needs to comply with political relations between the two countries. US Senator has stressed the solid support to Georgia and process of its Euro-Atlantic integration. Meeting inter alia referred to the regional challenges. Lindsey Graham reiterated his support towards the territorial integrity and sovereignty of Georgia. According to him, Georgia enjoys strong support from US Senate, as numerously demonstrated before both in its Resolutions and Consolidated Bills with supporting provisions. Senator has clearly stated that such support towards Georgia will be further intensified in future.